천안 브레벳 모두에서 대회는 KTX 천안아산역에서 시작하게 됩니다 --- The ride start for the 200k, 300k and 400k Cheonan Brevets will be at the Cheonan-Asan KTX station. 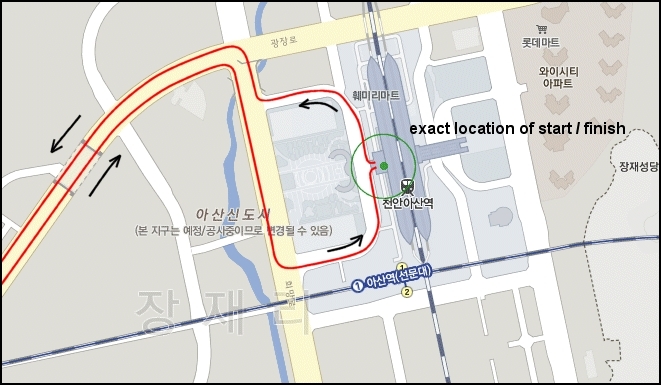 Cheonan 300K Brevet: updated maps, cue sheets and gps files have been posted. Riders need to print their own maps and cue sheets. A limited supply of maps will be for sale at the start" --- 천안 300K Brevet: 지도, 큐시트, 그리고 GPS파일들이 업데이트되어 포스팅했습니다. 라이더들은 본인의 각자의 지도와 큐시트를 프린트해 오셔야합니다. 출발점에서는 소량의 지도만 판매될 예정입니다. 입금 후, Brevet에 참가를 하지 않기로 결정하셨더라도 환불은 불가능합니다. 죄송합니다! 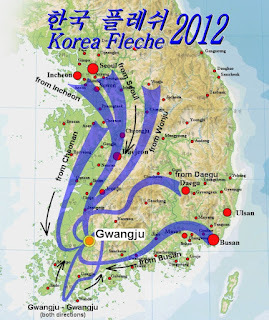 Fleche 2012 - 플레쉬 2012 3월 31일에서 4월 1일에 걸쳐 24시간짜리 "플레쉬" 팀 대회가 열릴 예정입니다 (상 세정보). 네 팀이 경로를 제출했으며 모든 팀은 광주로 향하게 됩니다. 천안에서 출발하는 낙지팀 (경 로), 부산팀 (경 로), 대구팀(경로), 광주팀이 있습니다. 부산팀에 참여하고 싶으신 분은 얀 분스트라 (Jan Boonstra) 님에게, 천안팀은 로타 헤닉하우즌 (Lothar Hennighausen) 님에게, 대구팀은 러셀 모리스 (Russell Morris) 님에게, 광주팀은 서상원님에게 연락을 주시면 됩니다. --- The 24 hour "Fleche" team event will be held on March 31 and April 1 (details). Five teams have submitted routes and they will converge on Gwangju. Team Nakji will start from Cheonan (map), team Busan (map), team Daegu (map), team Gwangju (map) and team Seoul (map). Riders interested in joining the Busan team should contact Jan Boonstra, for the Cheonan team Lothar Hennighausen, for the Daegu team Russell Morris, for the Seoul team Han Chul Woo and for the Gwangju team Seo San Won.